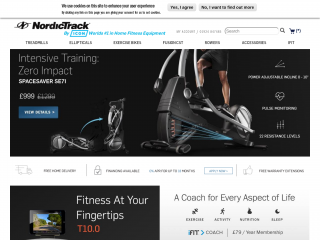 World leader in home fitness equipment and part of the ICON Health & Fitness group, NordicTrack has over 25 years experience in bringing high quality, innovative exercise equipment to market. In the 90's we expanded our expertise to other areas such as treadmills, exercise bikes, ellipticals and more. To drive their success, we focused on the same key elements that have made our original skier an international success: a mix of design, style and innovation. Investing heavily in research and development, NordicTrack guarantees our products feature the most advanced technology available. Interactive fitness with iFit powered by GoogleMaps, touchscreen displays with web browsers, adjustable treadmill cushioning systems and much more... we strive for you to succeed and provide the tools to help. Along with sleek aesthetics, these features make NordicTrack the best choice to start your home fitness regime.